Just as its name implies, Samsung’s Family Hub refrigerator was designed to serve as a communal center for the home. Its large touchscreen display and intuitive suite of apps were crafted to streamline not only food management, but also family communication and kitchen entertainment. 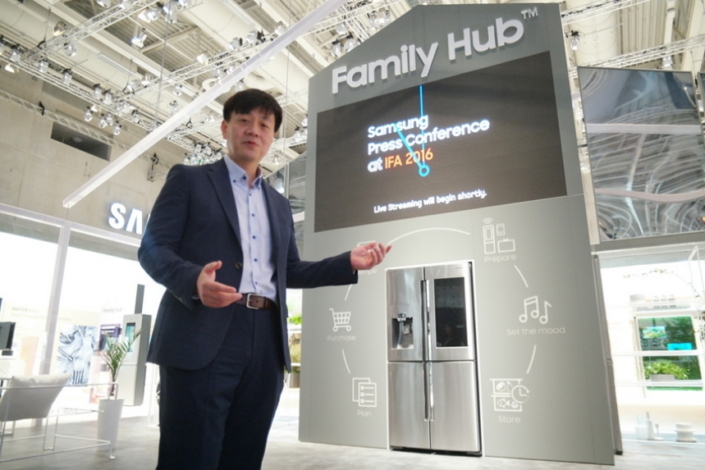 In conjunction with Family Hub’s introduction to the European market, Samsung’s Vice President of Refrigerator Product Marketing, Ik-su Choi, explains how the company’s latest refrigerators have been optimized for European families’ use. Q. This year, Samsung created a Family Hub refrigerator with a design that reflects a more European style. What have Europeans’ pre-launch reactions to Family Hub been like? There has been great interest in seeing the launch of a BMF (bottom-mount freezer) model for the European market. We’ve received a lot of questions regarding their introduction there since they were first released in the US and Korea, but because we needed time to cultivate suitable partner companies and properly localize the product for each country, we decided to launch Family Hub at IFA. In terms of content, Family Hub’s food management and smart home functions were very popular. There were also a lot of questions regarding the mobile sync function. Q. Family Hub is clearly designed for family use. Nevertheless, there are some cultural differences in terms of family life between Korea and Europe. Do you think European consumers may utilize Family Hub differently in their daily lives? Family Hub is equipped with content that is communicable worldwide, as one thing that is universal and unchanging is the value of family. As a center of family interaction, Family Hub can be a platform that allows families to communicate better and more conveniently, through digital handwritten notes as well as apps like Sticki. If Family Hub plays this small role in helping people have conversations, I believe that is a meaningful start. Q. You are an expert in the field of home appliances and are well-versed in the history of refrigerators. What do you think their future will be? Previously, capacity and storage efficiency were the main competitive factors with regard to refrigerators. Our company has historically excelled in these aspects, regularly achieving a number-one market ranking through extreme innovation. Under the new paradigm—centered on IoT—consumers’ needs for new categories of products like the Family Hub refrigerator will grow. Refrigerators will no longer remain merely storage devices for food, but will become devices that families use together. They will become a central kitchen appliance, allowing people to communicate, and not only store food, but even purchase and manage it. Consumers’ need for not just simple refrigerators but smart refrigerators will continue to increase, and we will respond to this trend by further evolving Family Hub in ways that are customized to various markets—utilizing their environments—and continuing to expand our lineup. Q. Design has traditionally been the key factor driving consumers’ BMF refrigerator purchases. How did the European Family Hub’s design come about, and how are the refrigerators built to remain durable, reliable and innovative for years to come? The BMF-style refrigerator—refrigerator above, freezer below—is the most common design in Europe. That is why we released this style of refrigerator, fit for the European market and enhanced with Family Hub’s premium functions and usability. To build it, we loaded a large interactive LCD screen onto a previous BMF framework, resulting in a Chef Collection design of peerless technology that fits beautifully in the kitchen. In terms of reliability, Family Hub’s hardware and software have been designed to be continuously upgraded, and in the case of the LCD screen, a product that guarantees 10 years of durability was used. By attaching it using a modular method, in which replacement and repairs are easy, we allow continuous technological upgrades, as well as changes to reflect trends. Q. What are some of the apps and inner features that will help consumers bring their cooking skills up to par with, say, the Michelin-starred chefs of Samsung’s Club des Chefs? We are planning to load Family Hub with apps like Allrecipes, Whisk, ChefKoch—a local recipe app—and the Club des Chefs app, which all offer delicious recipes. We are also planning to provide insight into different ways to cook using Family Hub. Q. Which Family Hub app do you believe is a game changer? Family Hub’s applications constantly evolve. It is composed of apps that consumers need based on the four pillars that fit consumer trends, and it will constantly be updated to reflect those needs. Thus, Family Hub itself will surely play the game-changer role that changes the market’s dynamics. Q. Family Hub is further proof that Samsung is setting a standard in IoT. Why do you believe Samsung has managed to achieve such success in this relatively new field, and how is that experience reflected in the Family Hub refrigerator? In this IoT era, consumers have grown used to conveniently connecting with devices, based on their smartphone experience, and they want to connect with even more devices in ways that further benefit them in daily life. Samsung applied technical expertise gained from smartphone and Smart TV experience, along with advanced abundant-usage scenarios based on our accumulated knowhow of household appliances, to create Family Hub and deliver seamless usability to consumers. Drawing from such expertise, we will be able to deliver differentiated user experiences that could not be provided in the past, and bring about big change in consumers’ lifestyles through Family Hub. Q. The Family Hub refrigerator offers incredible insight into the freshness of our food. What are some of the ways it allows us to store goods efficiently while saving energy? Family Hub features a large LCD screen that is efficiently managed with an adjoining sensor. By using the inner-view camera, which allows users to see the inside of the refrigerator without opening the door, users can prevent unnecessary energy consumption. This is one of the reasons why Family Hub has a high-energy consumption efficiency rating of A++. Family Hub also helps minimize food waste by keeping track of the location of fresh foods and their expiration dates and allowing users to prevent unnecessary purchases by giving them the ability to look inside their refrigerator via mobile device anytime, anywhere.